Admired for her intelligence and her many accomplishments, “Dr. Marla,” or “Canada’s Doctor,” as she is known, seemed to have it all. But on Friday, August 13, 2004, Shapiro found out she had an invasive form of breast cancer. Like the more than 20,000 Canadian women who are diagnosed every year with the disease, her world changed forever. But unlike most of those women, her status as a physician meant she had an insider’s knowledge of the disease and treatments. 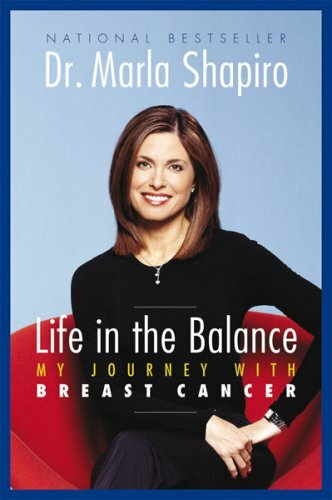 Life in the Balance is Dr. Shapiro’s intimate, inspiring and often surprising account of her illness, from the shock of the initial diagnosis to multiple surgeries, chemotherapy and her agonizing decision to have both breasts removed, followed by reconstructive surgery and recovery. She candidly recounts her struggle going from the woman who routinely delivered all the seemingly right answers to her patients and her family, to the woman who quickly discovered that there were no right answers when it came to her own life-altering decisions. Receive notice of Marla Shapiro’s new books, tour dates and promotions. I have never been a superstitious person. After all, I am a doctor and have been trained to believe in science and evidence, to make a diagnosis and move forward with the best steps towards management—trained to take control. But it is true that as a doctor there have been times when I was overwhelmed by the inability to take control, times when I have been powerless to intervene and could only stand by, hoping to make things easier, if not better. So it was ironic that on Friday the 13th—August 13, 2004, to be exact—I was diagnosed with breast cancer. That diagnosis and everything that followed came to define my life for a time and would ultimately change me forever. It marked an invisible boundary, a before and after, by which everything in my life—and in the lives of my husband and children—would be measured. As I stood in the hallway of the mammography suites, listening to the words “suspicious for breast cancer,” a feeling of powerlessness came over me. I knew I was taking a step into the world of after. I knew because I had been there before. Almost eleven years earlier, on the morning of November 28, 1993, I woke with a start, a horrible sense of apprehension. As I walked down the hall to my infant son’s room, I felt instinctively that it was too quiet. I began to run. Throwing open Jason’s door, I knew that I would find him as I did: on his stomach, face down, dead. I remember picking him up, running, screaming, trying to resuscitate him, seeing the fear and disbelief on the faces of my older children. I knew there was no hope. Within minutes of my husband calling 911, the fire department and police descended on our house, whisking Jason to the nearest emergency room. With bile in my throat, we got in the car and followed, then sat in the waiting room of the hospital, knowing that he was gone. When they finally came to confirm our worst fears, I could hear an agonizing scream come from somewhere deep inside. Our lifeless son was brought to us to say goodbye, his mouth bandaged from the trauma he had sustained during attempts to resuscitate him. My son Jason, a perfect child in every way, a gift to a family that had already endured tragedy, was dead at five and a half months of age, of sudden infant death syndrome (SIDS). His death was like hitting a wall, no way to get through it, past it or around it. It marked the first invisible boundary in the life of our family, the first before-and-after moment. Now, in 2004, we were all changed people, a changed family, but we had gone forward, living our lives, having been touched by Jason. With my diagnosis on Friday, August 13, we were about to change again. On my 40th birthday, three years after Jason died and one year after the much-wanted birth of our son, Matthew, my girlfriends gave me a beautiful luncheon. Many of them had been traumatized at the thought of turning 40. I remember making a speech in which I said that turning 40 was a cakewalk—it was getting to 40 that had been so damn hard. At 48, facing a diagnosis of cancer, those words echoed inside my head as I wondered if I would make it to 50. Among the difficult treatment choices I made was the decision to have a bilateral mastectomy. I also knew that I could elect to have reconstruction. I wanted not only to look normal, but to feel normal as well. Currently, in Ontario, less than 10% of women who undergo mastectomy are reconstructed. Because of our health care system, access to breast reconstruction is not influenced by ability to pay. In Canada, waiting times to see reconstructive surgeons are horrendous, as the demand far exceeds availability. Many women are unaware that the option for reconstruction even exists. It is clear that physicians and patients need to be aware of the surgical options…And we have to attack the shocking lack of resources and trained physicians. I’d like to invite you to help me establish a Chair in Breast Reconstruction Surgery. Establishing a chair and a reconstructive center of excellence will lead to the development of patient education programs and clinical research to improve outcomes for women seeking reconstruction. It will lead to the training of dedicated breast reconstruction surgeons so that more surgeons will become experts, foster an interest and carry out the surgery across the country. Breast cancer…the fight goes on for early detection and improved treatment options. Please join me in making a difference.